I thought I would share with you all some of our pictures from our visit to the Grayson Highlands Festival today with the Horn’s. �We saw lots of crafts and hand made items. This was one of the biggest attractions. �The making of molasses. 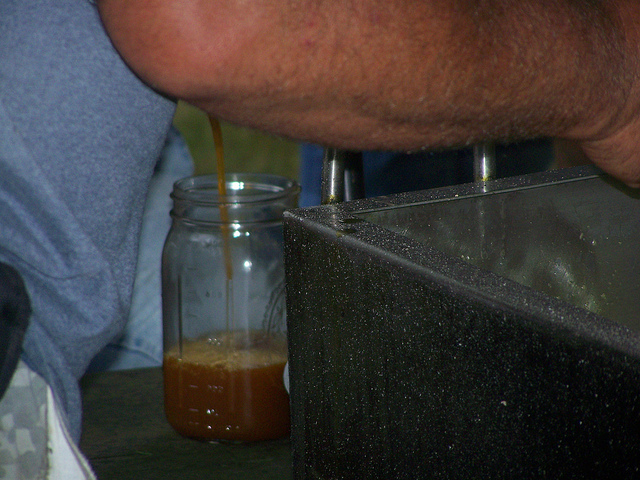 Here they are pouring the hot fresh made molasses into jars for selling. �We, of course, bought one. There was lots of food and lots of music. But these little guys were the main attraction. 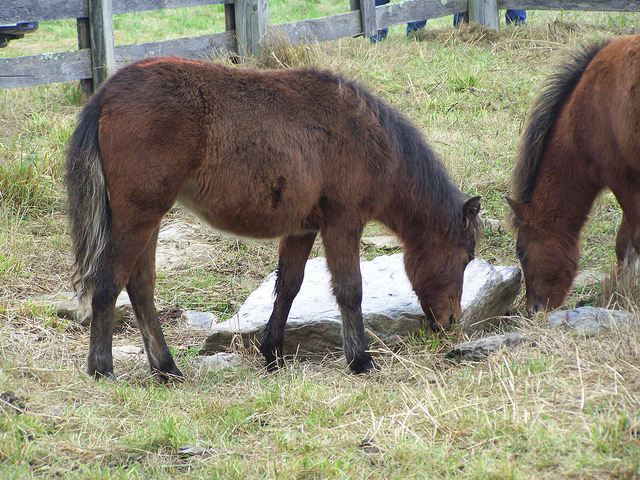 �They auction off these wild ponies every year. �We stayed for a little of the auction but the rain finally forced us to leave. It was a really fun day. �I will show you some more of the pictures with the fall colors in my next post. �I hope you all have a great weekend and God bless. I think I like the new ones better. �I am hoping they will catch customers attention more. �We’ll see. Well, that’s my day. 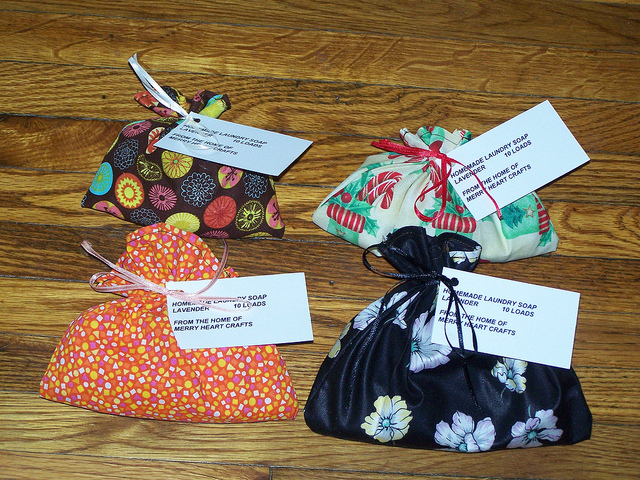 �It took a little longer to sew these little packets than I first expected, plus we had to make up the laundry soap. �All our soap had sold at the Bread Basket. 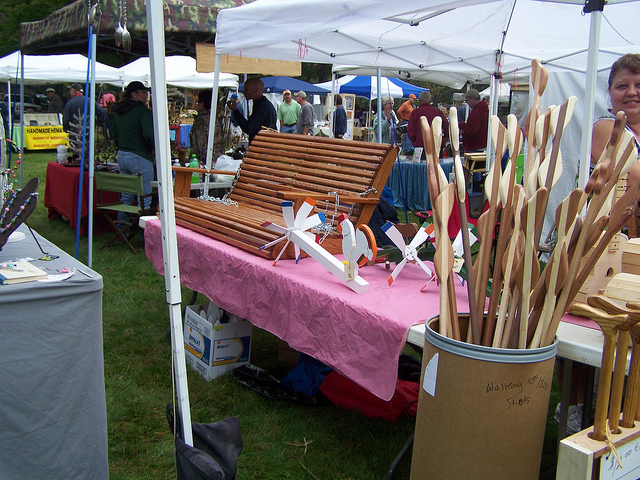 �Tomorrow is a big day for shoppers here in Floyd-the annual craft festival. 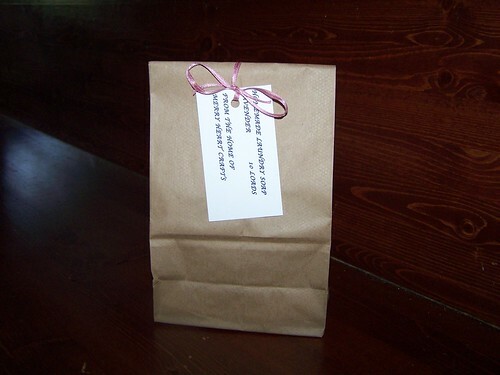 �We wanted to make sure we had plenty of aprons and laundry soap on hand for selling. We had a great supper of pork, pintos, mashed potatoes, rolls, peaches and pears. �After cutting, loading and unloading two truck loads of wood, everyone was hungry. �As they were leaving, I gave them all an apple for the road. �Alexius was getting in the car and got her finger shut in the car door. �Chuck asked her how she managed to do that and she said, “I was trying to hold my apple and I wanted to give MawMaw another hug”. �I felt so sorry for her. I have been helping Hubby all this week with a bathroom remodel. �We finished it today. �Tomorrow, he will start installing the cabinets at the old farmhouse he has been working on. 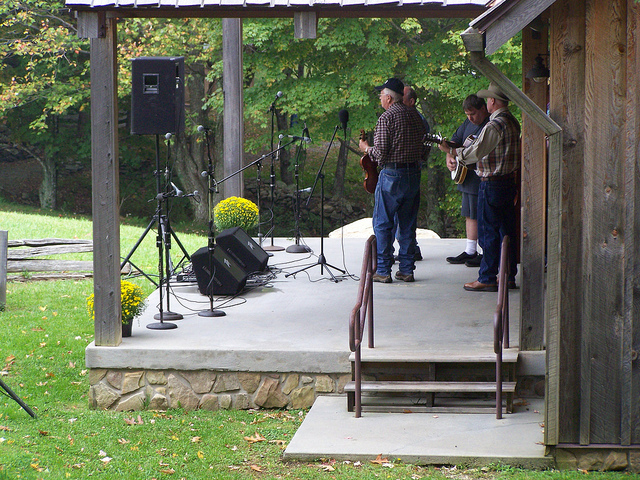 �We plan on going with the Horn’s this Saturday to Grayson Highlands for their fall festival. �We are looking forward to it. �It sounds like lots of fun. �Well, I think that’s about all that is happening around here. �I hope you all have a great evening and God bless. 2 eggs beaten, 2/3 cup sugar, 2/3 cup uncooked oatmeal (I prefer old-fashioned oats but quick cooking will work as well) 1 tsp. vanilla, 2/3 cup melted margarine, 2/3 cup corn syrup, 1/4 tsp. salt. Mix all ingredients together and pour into uncooked pie shell. �Bake at 350 degrees for about l hr. �Tastes very similar to pecan pie. Hello everyone! �I thought I would tell you all a little about our trip yesterday. �I did not get any pictures-sorry. �We didn’t actually go down into the town of Mt. Airy so we didn’t see any Andy Griffith stuff. �We did have a great time though. �We left here about 8:30 yesterday morning and got home about 6:00. �A full day. �We stopped at lots of produce stands. �They were all stocked with beautiful fall mums, pumpkins and such. �We ate lunch at Libby Hill. �We enjoyed it a lot. �We then walked around inside the Mayberry Mall for a while and had ice cream as a treat while in the mall. �On the way home, we stopped at a few more produce/farmer market type places. �Hubby bought 2 knives that he thinks will be good knives for working up deer and other meats. �I bought 10 lbs of pintos, 5 lb. kidney beans, 4 lb. black beans, 3 lb. yellow eyed beans, some white sweet potatoes and a cushaw. �I am hoping to can most of the beans to have on hand when I need them quickly. We are working on our last sack of apples today. �I am ready to start canning something else (beans, soups, and chili). �Temperatures here are beautiful. �Much cooler with lots of sunshine (after our downpour the other day). �Dave, Jess and kids are coming up tomorrow. 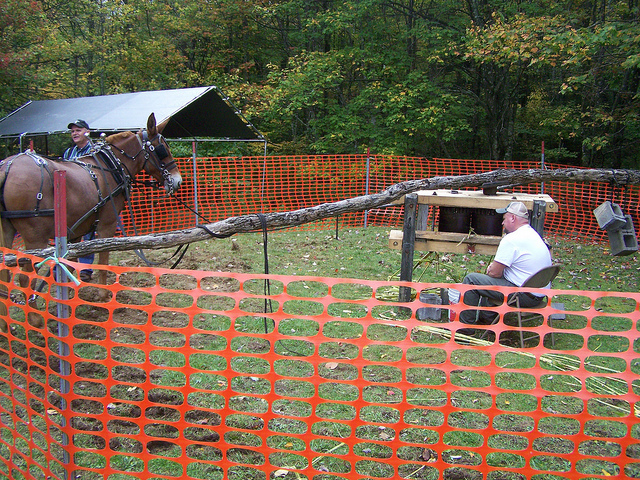 �The pastor has a clay shoot at his house every year. �Dave and Hubby are going to it while the rest of us go check out some yard sales and maybe a trip to Michaels. �Jess has requested an oatmeal pie for tomorrow. �I plan on making that this evening. �It is a very good pie that tastes like pecan pie, just less expensive to make. Well, I guess that is about all that’s happening here. � I hope you all have a great day and God bless. Hello everyone! �We are really getting rain today. �I think it is predicted to get about 5″ but I think we have already gotten that much. �Well, we really need rain so I’m thankful besides I love the sound of rain on our tin roof. �Makes me want to curl up with a good book and a cup of coffee or tea. �However, that is not possible as we are still working on apples. �I love the fact that we have all these apples but I am getting a little tired of working on them. �So Thursday or Friday, Mrs. Faye and her hubby and us are going to Mt. Airy to purchase new crop pinto beans. �We will be spending the day looking at little shops along the way and fun things like that. �Then she and I are going to get together next week and can them or at least that’s the plan as of now. �I went to her house yesterday to help her with her apples. �We did apple juice, applesauce and canned apples. �We had a lot of fun together. Well, that’s about it. �Sorry I haven’t posted much but there’s not much going on here. �I don’t think I mentioned it but Mt. Airy is the home of the Andy Griffith show. �Have any of you ever watched it? �I’ll try to take some pictures to show you all. �Enjoy your day and God bless. Hi everyone! �Today is a beautiful day here in Floyd. �Actually it has been a beautiful week so far. �Our nighttime temperatures have been in the mid 40’s and daytime highs are low 70’s. �Perfect temps in my opinion. Sunday we took the girls to Tweetsie Railroad for a day out. �We had actually planned on going with Dave, Jess and kids but the kids had some type of virus going on. �Daniel and Sam had it earlier in the week and we thought maybe Katie had escaped getting it. �However, Saturday afternoon Katie came down with it so they did not get to go with us. � Hubby actually decided to go with us at the last minute. �He is not much for amusement parks but I think he didn’t want us going alone. �We had a really fun day but kept missing Jess and crew. �Sam so loves trains. Today we are working with apples, SURPRISE! �We also had 4 more l00 lb sacks of apples gave to us Friday evening. 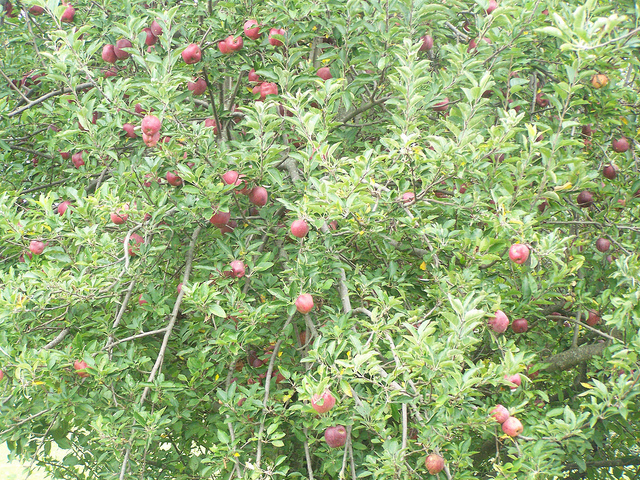 �We will have plenty of apples this winter. �I am juicing most of the ones gave to us Friday. �We are making applesauce and applebutter too. �Our steam juicer and our sauce maker sure do make this work go faster. �I am very glad we have them. Seems like we have been so busy here. �I haven’t had time to make a post or read anyone else’s posts. �I will try to catch up some today. �Enjoy your day and God bless. Monday, the girls and I went to the pastor’s home to pick apples. He has about 10 trees (I think) and they all look like this one. �We picked three 100 lb. feed sacks full. 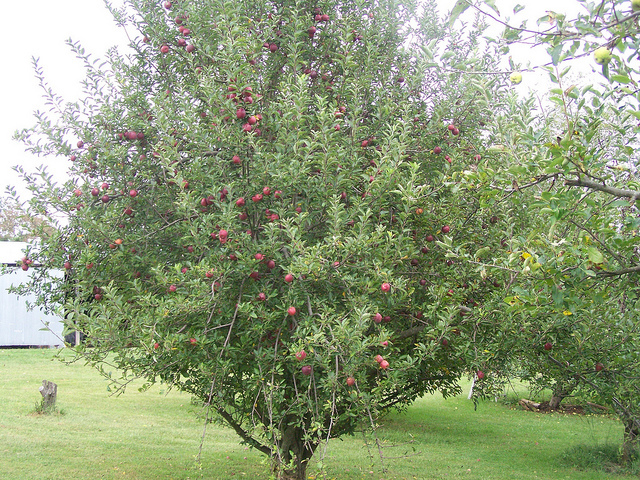 �I am estimating each sack holds 1 and 1/2 bushel of apples. �So that means we got close to 5 bushels of apples. �At our local store, apples are selling for $20.00 a bushel. �That means I have about $100.00 of apples sitting in my kitchen that were just gave to me. �God is good!! �They also gave us the last of their grapes-about 1 bushel. �Yesterday, the girls and I juiced the grapes they gave us and did one batch of juice from our grapes. �We also did a batch of apples in the juicer and tried a new recipe crockpot maple apple jam. �It is very good. �It reminds me of apple butter but has a�distinctive maple taste. We picked the last of our grapes today-about 1/2 bushel. �We put them in the fridge for today. �Maybe we will just eat on them for a while instead of juicing them. �I hope to do more apples this evening but I’m not sure. �We might have to wait until tomorrow to start on them. �I am wanting to try a new recipe I saw for apple pie using honey instead of sugar. �It looked really good. Well, I guess that’s all that has been going on around here-just grapes and apples. �I hope you all have a great day and God bless.